I’ve been a baseball fan as far back as I can remember, and for me that fandom didn’t end when the season did. I was always a numbers guy, so in middle school I made up the rules to my own baseball (and football) games using dice to simulate results, and latched onto fantasy baseball shortly after. When the baseball season ended and I still needed my fix, I turned to Strat-O-Matic, the much more advanced version of my simple dice game. As I entered college I discovered baseball sim games on the computer, starting with Baseball Mogul and ending with Out of the Park Baseball (OOTP). I’ve been playing OOTP to get me through the long baseball offseason for at least ten years, and every new iteration becomes more and more immersive. The newest version (OOTP 18) is out, so I decided to project the results for one of my ottoneu leagues (League #530) with an OOTP simulation of 2017 (hat tip to league-mate Brent Daily for the idea!). Bear in mind, I ran just a single season simulation to get these results, I didn’t have the time (or inclination) to run multiple simulations, so think of these projections as one possible 2017 universe. In this particular universe, and quite likely in most possible futures, Harrisburg Mayflies runs away with the title. My own team, Chicago Whales, finishes a disappointing seventh. Also note that the league wide offense is even higher than ’16 levels, and the pitching is much worse. One interesting dynamic in this league is that the bottom two teams beginning this season will be relegated, with the two top finishers from a feeder league taking their place. That means Greg Bird and Yasmanchester could find themselves being kicked off the island. Not too many surprises on those lists, with the most notable exceptions of Nomar Mazara (he hit 51 homeruns!) and Michael Lorenzen (who saved 39 games in 84 innings for the Reds). Players who had poor seasons include Giancarlo Stanton (4.51 PPG in only 75 games), Stephen Strasburg (4.34 Pts/IP), and Madison Bumgarner (4.26 Pts/IP). The results look pretty sane to me, though the Twins winning 88 games and the Cubs and Dodgers both failing to win 90 games are surprising. Does this OOTP simulation represent a likely outcome? Or does it show the darkest timeline? We’ll have to wait and see! We hoped you liked reading Simming an Ottoneu Season for Fun (and Profit?) by Justin Vibber! 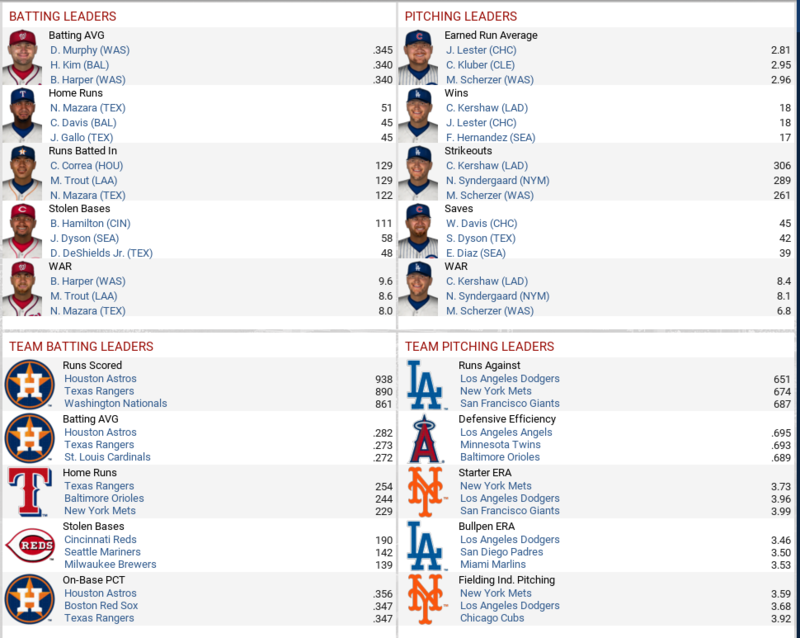 Kershaw coming in 4th or worse in ERA? This must be the darkest of all timelines!